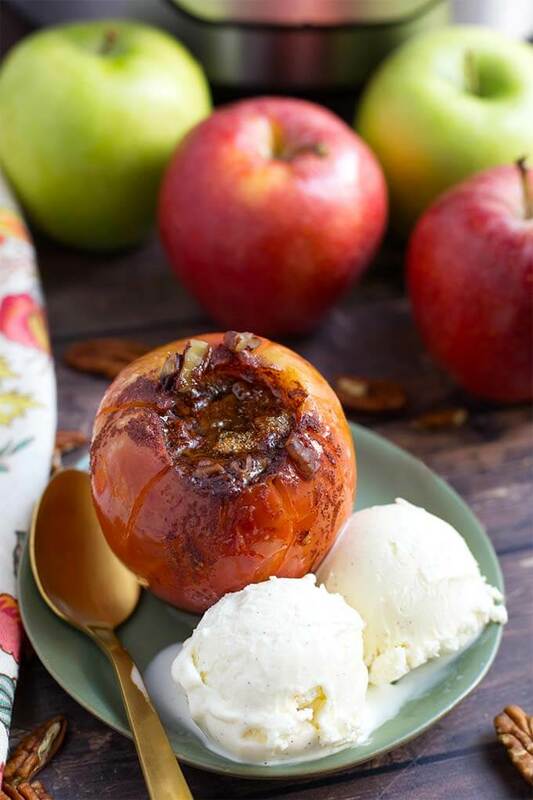 Instant Pot Baked Apples are a delicious sweet treat! 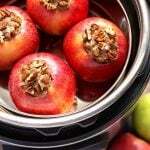 These pressure cooker baked apples are flavored with a tasty cinnamon butter, brown sugar, and chopped pecans. They only take minutes to cook. 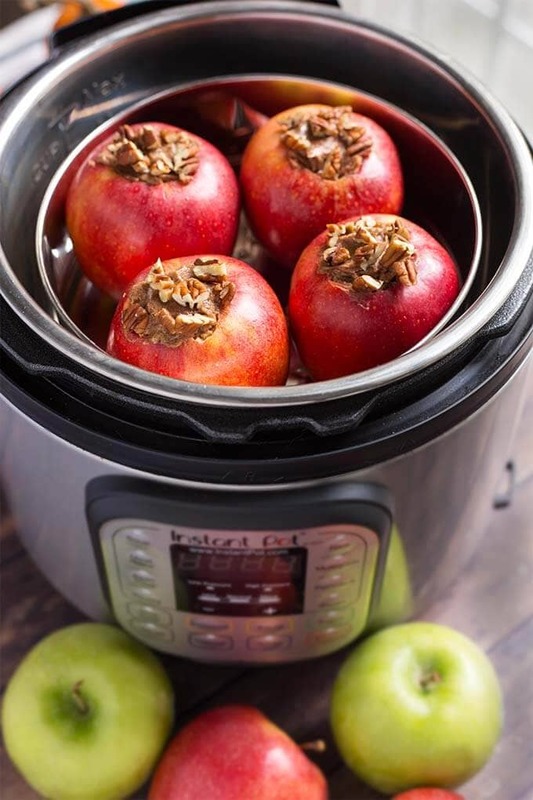 We love how easy it is to make baked apples in the Instant Pot! Ever since I was a kid I have loved apples. Growing up in Washington State, we have access to lots of apples. I can’t remember a time when there wasn’t a bowl of apples in our kitchen! Of course, baked apples were a delicious and very affordable dessert in our home. Even us kids could make them without much supervision. Since I bought my Instant Pot® almost 3 years ago, I’ve wondered if making baked apples in it would work. So I did several tests and came up with a recipe for Instant Pot Baked Apples that I really like. My family really likes them, too! For this recipe I used my 6 quart Instant Pot® pressure cooker, the metal rack/trivet that came with the pot, and a 7″ diameter pan that I put the apples in. 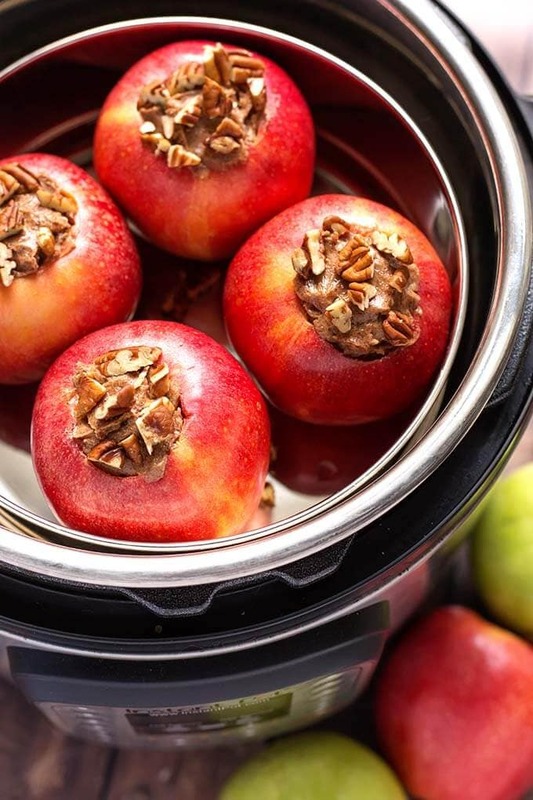 Instant Pot Baked Apples are made using the Pot-in-Pot (or PIP) method. That means you are cooking with a separate pan (containing the food) within the pressure cooker pot. Just make sure to put water in the inner liner of the Instant Pot, and always set the pan with the food in it on a rack so it doesn’t touch the bottom of the pressure cooker’s inner pot. You can cook the apples directly in the inner liner of the pressure cooker, but I tested that method and had a lot of watery apples, and I didn’t like them as well as when I made them with the PIP method. So it’s up to you. If you do it that way, reduce the time to about 4 minutes, and reduce the water to 3/4 cup. Maybe try using apple juice. 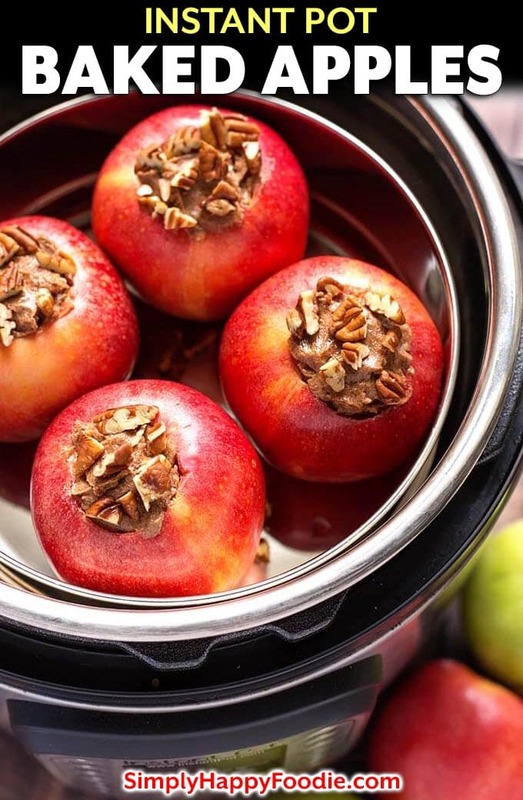 Instant Pot Baked Apples are a delicious sweet treat for Fall! 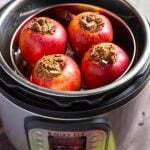 These pressure cooker baked apples are flavored with a tasty cinnamon butter, brown sugar. They only take minutes to cook. Pour 1 1/2 cups of water in the inner liner of the pressure cooker. Wash and core the apples, leaving some of the bottom intact to hold the filling in. Use a melon baller or similar spoon-type utensil to scoop out a bit of the flesh. Not too much! Mix the butter, vanilla, cinnamon, brown sugar, and pecans together and fill the apples wth the mixture. Put the apples in a pan that is 7" in diameter and set on the trivet/rack and put it in the pressure cooker. Put the lid on the pot and set the steam release knob to the Sealing position. Press the Pressure Cook or Manual button or dial, and then the +/- button or dial to select 11 minutes (9 minutes for a firmer result, 14 minutes for a softer result). Size and type of apple makes a difference. High Pressure. When the cook cycle is finished, let the pot sit undisturbed for 5 minutes (5 minute natural release). Then turn the steam release knob to the Venting position to manually release the remaining steam/pressure. When the pin in the lid drops down, open the lid and use tongs to remove the apples. Serve with some vanilla ice cream for a decadent dessert! You say shorter cook time for firmer apples, that seems backwards. Lol ugh people, trying this tomorrow thank you!! What type of apples do you use? I use Fuji, Gala, whatever I happen to have. If you use Granny Smith, you may need more sugar as they are tart. Can you use a 6″ diameter pan? I would like to try is recipe. Yes, any size that fits comfortably. If you need more servings you may need to get smaller apples, but that’s optional! Could you use a pyrex glass bowl for the inner pan? If it is oven safe, you should be able to. I have done it with no issues. I can’t guarantee results.